India is very well known for its festivities, we are probably one of the only countries that celebrate so many cultures and festivals. One such festival that is celebrated with grandeur is Dussehra. 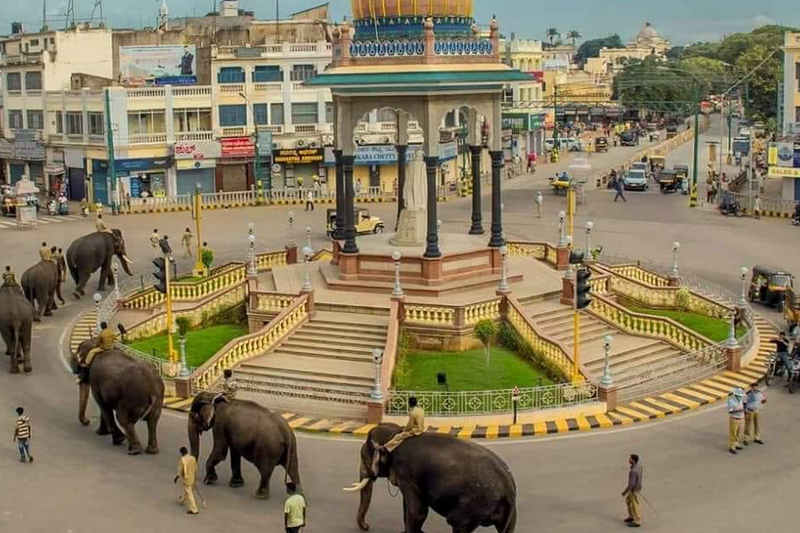 If you are in South India, you’ll definitely know all about this beautiful festival that is celebrated with much grandeur and pomp in Mysore, the city of palaces. The Dussehra celebration in Mysore is something on every Indian’s bucket list. Thousands of people throng the city as the festival approaches to witness a majestic celebration of the triumph of good over evil. The celebration goes on for over three days and includes a very well decorated and lit up Mysore palace, procession of the Goddess Chamundeshwari on a decorated elephant, a procession troupe that includes bands, dancers, and more. This celebration is a sight to behold and once you witness it you’ll want to come back every year for the rest of your life. Like we already mentioned, thousands of visitors pour into the city to celebrate this festival and finding an accommodation in the city is pretty much impossible during this time. But not to fret, just a short drive away from Mysore is a classy accommodation, it’s none other than our Royal Airavatha Residency. What makes our hotel the perfect accommodation during this time is that it’s right in between Mysore and Bangalore. If you want to be a part of the Dussehra celebration this year, we suggest that you stay at our hotel instead of having to pay exorbitant prices for hotels in Mysore or having to settle for hotels that don’t stand up to your standard. What you need to know about Royal Airavatha! Location- Our hotel is located on Mysore road right in between Bangalore and Mysore. The hotel is located right on the main road and can be located easily. It is just an hour and a half drive away from Mysore city center. Rooms- There are two types of rooms at the property- Deluxe twin rooms and the Deluxe king rooms. All the rooms come with an attached bathroom and are equipped with basic room amenities. There is plenty of provision for natural lighting and the design of the rooms offers a serene vibe. Facilities- The hotel has an in-house restaurant, well facilitated conference rooms, and event halls. They also offer round the clock room service for all the guests. If you are planning on visiting Mysore this October, we highly suggest that you stay at Royal Airavatha instead of going through the trouble of finding an accommodation in the city at this time. Classy accommodation at a reasonable price and close to the festivities in Mysore is what you can expect here!